The FTB-100 Series of turbine meters have a sealed ball bearing design for high accuracy performance (±½% of reading, not full scale) at an economical cost. The non-metallic bearing retainers minimize friction, thereby allowing these meters to be used with clean fluids that have poor lubricating properties ( i.e.water). Ball bearings also give the widest linear flow range, particularly in larger turbines. Bearing replacement and clean-up are fast and easy, since all internal parts are easily accessible by removing a single nut. 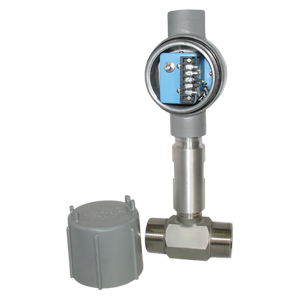 These turbine flowmeters have a low mass rotor design which allows rapid dynamic response, so they can be used in pulsating flow applications. Deflector cones eliminate downstream thrust on the rotor and allow hydrodynamic positioning of the rotor between the cones. This provides wider rangeability and longer bearing life than conventional turbine flowmeters. Integral flow-straightening tubes minimize the effects of upstream turbulence. FTB-100 Turbine Meters are available with integral signal conditioners (as shown in photo) which provide scaled and unscaled frequencies, 4-20 mA, or 0-5 Volt outputs. Units without integral signal conditioners are supplied with mating connector for two-wire hook-up. Body: 304 stainless steel; 1/2 NPT bodies contain Silver Solder. 3/4 NPT and larger are welded. 참고: Comes with NIST certificate for water and complete operator’s manual. Standard NIST calibration: Viscosity = 1CK: no charge; 0.8 CK to 0.99 CK: add $370; 2 CK to 100 CK: for FTB-101 through FTB-107, add $625; for FTB-108 and FTB-109, add $625, and for FTB-110 and FTB-111, add $465. If an integral signal conditioner is required please order as a system. Omega will scale the signal conditioner to the turbine meter. Example: SYS/FTB-101/FLSC-C1-LIQ, scaled system includes: Signal Conditioner, Enclosure, Turbine Meter and Fitting, $1954.